Would be fun to edit this post and make it current, yeah!? Would like to read about the updated tanks in the later tiers! So far the US heavy line progression has been pretty logical to me. T1HT: It can hold its own, no boss of the field, in many ways inferior to KV but pretty good all around. You could maybe put up with the sheer size of it and weak side/rear armor if it had a more powerful gun. M6: Guess what, you get your wish and 90mm is wonderful. You're just as big with not much better armor but the 90mm delivers in spades. Now you just wish the thing was a bit lower in profile and maybe bounce a bit more at least from the front for chrissakes. T29: And that's exactly what you get. This in comparison to Russian heavies where KV-1 teaches you bad manners, KV-1S is a bit of a glass cannon and IS actually fits somewhere in between those 2 for balance. Despite not being very active on the forums, I'm not actually dead. I'll be updating this guide in the near future when I get the chance. T1HT: I have yet to figure out why people call this tank a bad buy. Since day one in this tank, it's been nothing but pure, liquid fun. Yes the Sherman has its derp gun but with biscuit armor on that thing all it takes me is 4-5 shots to blow it away (faster if I track it first) and since the derp gun requires a good bit of aiming to do any real damage, by the time you're in their sites, you've already killed them, blown them up, and hung their smoldering shell casings on your mantelpiece. Worst T5 tank? More like worst T5 opinion (not meaning the guide creator ^^). Only when the T1HT is in the high tier does this thing become a force to be reckoned with. I've actually found the KV-1 to not be as big of a threat as people think they are. I just aim for the turret while their shells bounce off my frontal and bam, they're dead, I move on. Simple. Back before the matchmaker spread changes, the T1 Heavy got punched around... a LOT. It was a fairly painful tank, since it regularly was placed in tier 8 matches. Fortunately, this is no longer the case. 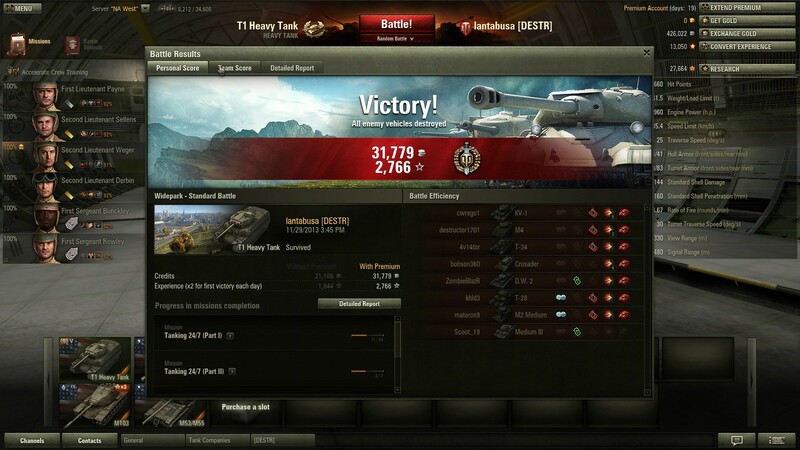 I've actually been inserted into Tier 8 matches on a few occasions with the T1HT. Of course I died, horribly, seeing as to how my gun is a to a toothpick what theirs is to a cannon that fires entire trees at you. Not in the current WoT you haven't. T1 is a tier 5 heavy and will NEVER see Tier 8 or above unless you platoon. Tier 7 is the highest you will see. In the current patch? I'm not sure how long ago it was since the game was updated, but I swear I have had Tier 8 matches, dying in nearly every one of them. I'll run replay mode on in case I happen to come across one, or I could just pull up battle records. I personally haven't had it happen, but that certainly isn't to say that it can't. Still, since the matchmaker changes, there has been a measurable improvement in matchmaking for the T1 HT. Edited by JDCollie, Jan 17 2013 - 20:21. I'm not sure if this is possible but i'm grinding thru the American Td, medium and heavy line, only thing is I skipped T1 and M6. Now I got my 90mm from Jackson and I'm going for T29 thru Jumbo so will that still unlock the T29's 90 mm? The 90mm on the Heavy/Medium line is a different variant than what is used on the TD line. Although they are pretty much the same gun for the most part, they had different names. On another note JD, if you need a bit of help updating the guide with new screenshots or anything, I'd be happy to help considering I'd like to see it updated with all the changes that have been made within the past six months. Edited by Slywolf15, Feb 18 2013 - 07:49. No. What you've got is the AT variant of the gun (better accuracy and fire rate). You get a full extra tier to train your heavy tank crew. This is even more crucial if you run non-premium. ANY extra training you can get is worth it! And from what I'm seeing the T1 is a far more enjoyable tank than it used to be. It's the one area where all nations have an advantage over the German and Chinese trees: They all get at least 2 extra tiers of training heavies (Eg. The German line doesn't get a heavy until tier 7). France has a painful tier 4 heavy of course....which gives it 3 extra tiers of training. Edited by Tex_Arcana, Jul 22 2013 - 20:41. I found that I was very good in the T1 heavy, sure I would cry if 3 kv-1's came barreling down towards me, but as long as I was with teammates I could do a frightening amount of damage. However I disliked the M6 because it was basically a T1 with a minimal boost. I thought the primary reason to go through the T1 was so that you could get the 90mm M3 off of the M6. I killed 7 with my T1HT today in a tier 5 match. Fun tank I'll probably never sell as its my moneymaker. I can drive out and never shoot the gun, die, and make silver.